Tim Swanson, Dir Market Research R3 is a thought-leader in the blockchain community and author of three books. Currently based in the San Francisco Bay Area, Tim has worked in East Asia for more than six years and is a fellow at Singapore University of Social Sciences and previously was a fellow at the Sim Kee Boon Institute at Singapore Management University. He was the first advisor at Hyperledger (prior to its acquisition by Digital Asset), an advisor at Clearmatics. Wayne Vaughan is the CEO of Tierion, a proof engine that turns the blockchain into a universal platform for proving the integrity of any data, file or business process. Prior to Tierion, Wayne pioneered the development of marketing automation software. He is the co-author of Chainpoint, the first standard protocol for anchoring data in the blockchain. In 2004, Wayne was a member of the first team of amateurs to launch a rocket into space. Vinny Lingham, CoFounder/CEO Civic.com. He is a serial entrepreneur who previously founded the digital gift card platform, Gyft, which was acquired by First Data Corporation in 2014. After over a decade of experience in e-commerce, he realized that no-one had a universal solution to tackle identity fraud for consumers. 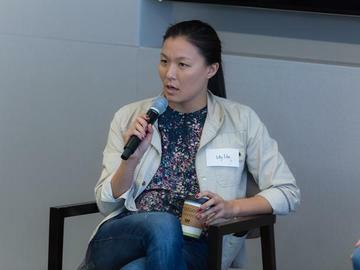 Lily Liu is the CFO of 21, Inc. She was previously the CFO of Chinaco Healthcare Corporation in Shanghai, China, founded by the Frist family of HCA, where she built a 500 bed hospital - and China's first foreign joint venture general hospital. Prior, Lily was a part of KKR Capstone in New York, and McKinsey & Company in New York and Beijing. She holds a BA in Economics and International Relations from Stanford University, and studied East Asian Studies at Harvard University.